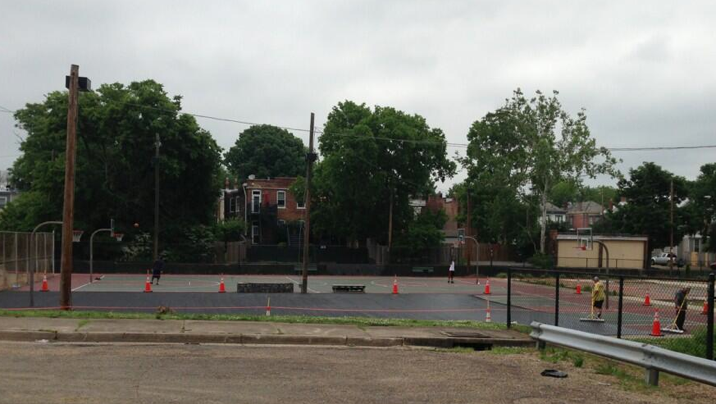 The long-anticipated resurfacing of the basketball courts at Chimborazo Playground got going today. And yet there was a guy out there today who ducked under the tape, no trespassing and wet paint signs, and was shooting hoops on the newly surfaced courts. I kindly asked him to stay off of them until completed. Ugh. I would LOVE to see some high quality trash and recycling bins with SIGNS encouraging basketball players to dispose of their trash. Every time I take my toddler to the playground, we pick up dozens of water bottles. My guy is under two and knows better, but signs could serve as a gentle reminder.